Return to Summer on the Dover Coast with a Concert & All Day BBQ! Join us at David's Restaurant on Sunday, June 23, 2019 for an all day bbq and musical guest Fred Eaglesmith, featuring Tiff Ginn! General Admission Tickets can be purchased at David's Restaurant for $35 (in advance) or $45 at the gate. Want the VIP experience? Purchase our VIP package (only 40 available) for $100 and get treated to VIP parking, private lakeside patio, private bar & a 3 course dinner! Find out more about this special event in our event calendar. 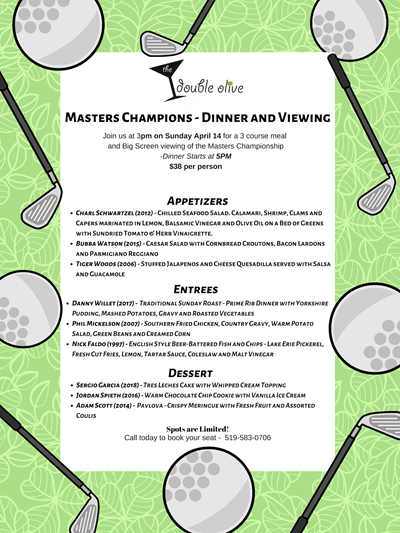 Join us in the Double Olive Lounge at 3pm Sunday, April 14 to watch the 2019 Masters Championship on the big screen and a 3 course meal! Dinner starts at 5pm. $38/person. Book your seat today! 519-583-0706. Treat mom to a special meal this Mothers Day! 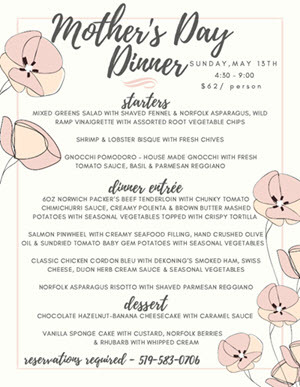 This May 12th, David's Restaurant is offering a Mothers Day Brunch and a Mothers Day Dinner menu. Join us for the entire month of March to satisfy that Lobster craving we all know you’ve been suppressing all winter! Restaurant Canada Show is a trade show and conference held in Toronto from February 24-26, 2019. The RC Show is Canada's largest foodservice and hospitality event and our own Head Chef, Scott McRae, will be presenting on Monday February 25 at 2pm about Feast On® 'Best of FOODstock' Tastings. 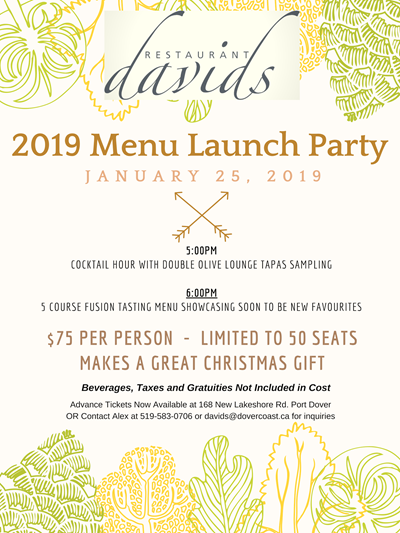 Join us at David's Restaurant on January 25, 2019 for the 2019 Menu Launch Party! $75 per person - Makes a great Christmas gift! There is still time to get Dover Coast gift cards for your loved ones! David's Restaurant will be open Dec. 24 from 9am-noon to process gift cards. Gift cards can be used at Elements Day Spa, David's Restaurant & Links at Dover Coast. We will be closed for regular business Dec 24, 25, 26 & Jan 1. David's will reopen for dinner Dec 27. Spa will open Dec 28. 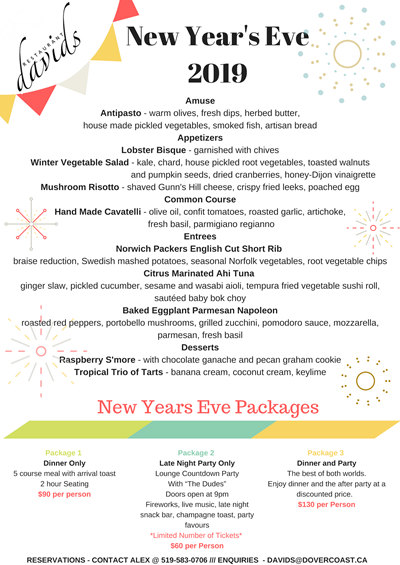 Join us this New Year's Eve for Dinner Only, Late Night Party Only, or Dinner and a Party! Visit our special menus section for more details and menu. Private dining, small groups, larger parties, staff outings, family gatherings - get together for the holiday season at David’s - book early to avoid disappointment - find our holiday menu in the special menus section. The Norfolk county fair is next week and our food trailer will be there all week – once featured on Carnival Eats – David’s food trailer is a must stop at one of Canada’s longest running Fairs! For several years we have had an annual Fall Harvest Dinner where we take the bounty from Norfolk County’s fall harvest and produce a unique menu for you to enjoy. Being a recognized Feast On facility we have now met the criteria for a unique campaign developed by the LCBO and Feast On to feature Ontario Wines with a Fall Menu. David’s Restaurant is dedicated to the growers, producers and harvesters of Ontario’s bounty. We pride ourselves on partnering with the list below of local producers. From their efforts our region grows. I am messaging you to praise the brilliant customer service we received from two of your employees. We frequent Davids and have had the pleasure of having Zanella as our server on many occasions. This past weekend we celebrated a birthday and an anniversary and chose Davids as our celebration venue. Zanella has an amazing flair with people. She is well versed with all menu items and always greets us with so much enthusiasm. We love her, she should be considered a GEM to your business. Nothing is ever an effort for her. Even when the restaurant is super busy we never feel neglected. Her smiling face is always just around the corner. We would also like to acknowledge Carlie McMaster. Our first encounter with her but an amazing one. She was so very personable and welcoming. I believe that she is a manager? My partner and I work in the world of physiotherapy therefore great food and wine are a staple in our lives. We love table 203. Have had many memorable celebrations at that table. Thank you for retaining such amazing staff. Please reward these two wonderful women for making our every visit to Davids another memory to hang on to. We are already planning our next visit. Oh by the way. I requested that the chef come to our table so that we could sing his praises. Zanella made it happen. Amen. Thank you Mr. Stortini for this amazing night. With grateful thanks. In an effort to ensure quality of product and service incumbent to the expectations of our guests we have introduced a new reservation policy for “groups” of 8 or more. Please review carefully as this policy will be part of our booking procedure for all “groups” of 8 or more. Thank you for your cooperation and we look forward to your continued support of excellent restaurant and lounge. 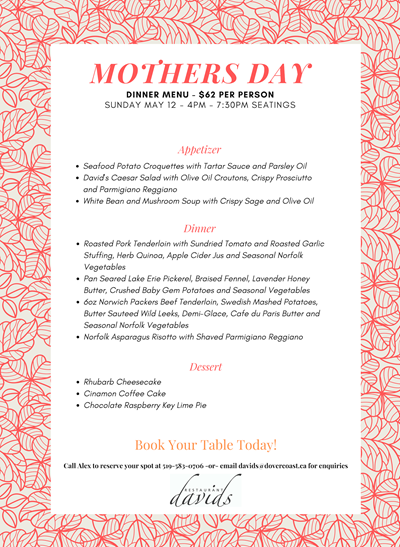 Treat mom to a special 3 course menu this Mother's Day! David's Restaurant will be offering a Mother's Day Brunch from 11am-3pm for $42/person, as well as a Mother's Day Dinner for $62/person. Reservations are required - don't miss out, call today! 519-583-0706. 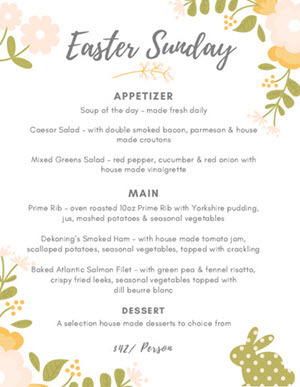 Spend Easter Sunday at David's Restaurant! Join us at David's Restaurant for a special Easter Sunday menu for $42/person. View special menus here. Call today to book your reservation! 519-583-0706. Join us this March for Lobsterfest! Appetizers & Entrées that are sure to please! Join us for lunch from 11am-3pm or for dinner after 5pm. View the menu here! Make your reservation today! 519-583-0706. Treat your special someone to a night out at this Valentine's Day! 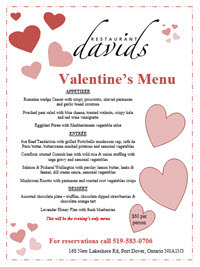 Join us at David's Restaurant this Valentine's day for a special menu prepared by our chefs. Dinner is $120 per couple and reservations are required. Book your table today! 519-583-0706. 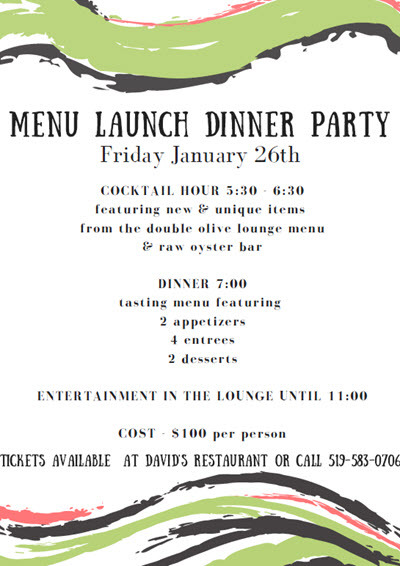 Join us on Friday, January 26th for David's Restaurant 2018 Menu Launch Dinner Party! Tickets are $100 per person. Cocktail hour from 5:30-6:30pm will feature new & unique items from the double olive lounge menu & raw oyster bar. Dinner starts at 7pm and includes a tasting menu featuring 2 appetizers, 4 entrees, & 2 desserts! Join us in the Double Olive Lounge for entertainment until 11pm. To get your tickets, stop by David's Restaurant or call 519-583-0706 today! MARK YOUR CALENDAR WITH THESE HOLIDAY PROMOS! Beginning in the New Year, our Wednesday night Oyster Night will continue but we will be adding a new feature - Oysters are $3 each or get 5 oysters and a Mill Street Organic for $19! This promotion runs all year long! 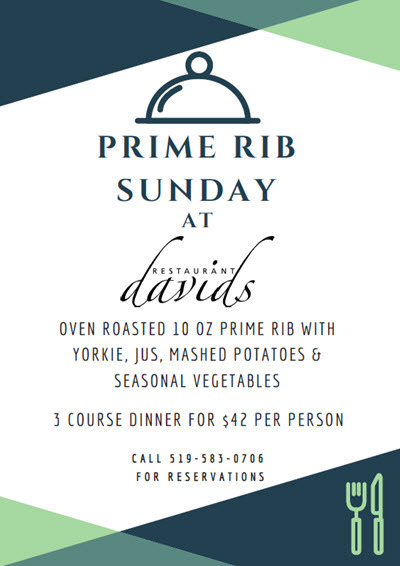 Starting Sunday, November 5th, David's Restaurant will be introducing Prime Rib Sunday! Join us for oven roasted 10 oz prime rib with yorkie, jus, mashed potato & seasonal vegetables. Fixed entrée for Sunday prix fixe menu - 3 course meal for $42 per person. Spend New Year's Eve at David's Restaurant! There are two options this year: enjoy a 5 Course Prix Fixe Menu & Champagne Cocktail ($85 per person), join us in the Double Olive Lounge for our Lounge Countdown Party - including music by Zach McCabe, hors d'oeuvres bar, champagne bar & fireworks ($60 per person), or spend the night with us by combining both options for $125 per person. Call David's Restaurant today 519-583-0706 or email davids@dovercoast.ca. Limited number of tickets available - all bookings will be held with a credit card. Menu discounts available this October if you golf at The Links at Dover Coast! During the month of October, if you listen to myFM 98.9 for that day's forecasted high, you can play 18 holes at The Links at Dover Coast for that amount! After your round, bring your receipt from that day to David's and get the same forecasted high as your food discount! Call the Pro Shop today to book your tee time! 519-583-2118. Join us for lunch or dinner at David's over the holidays! David's is now accepting Holiday party bookings! Reserve your spot today by calling 519-583-0706. Visit our Holiday & Special Menus page for detailed menu options. Father's Day at Dover Coast! Treat dad on Father's Day! Half Price Golf at The Links at Dover Coast with Triple Bogey Tastings All Day! Half Price Steaks at David's Restaurant All Day with Hometown Brew Co Tastings All Day! 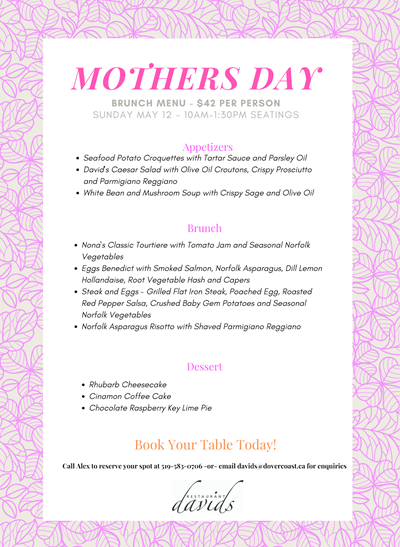 Spoil your mom with a delicious meal specially prepared by the chef's at David's Restaurant! On Sunday, May 14, 2017 David's is offering a lunch menu as well as a dinner menu that is sure to delight! Reservations are recommended, call David's today: 519-583-0706. 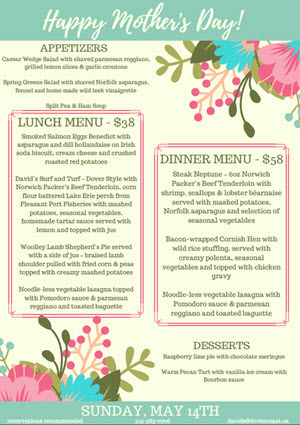 Check out David's Mother's Day Menu. It's almost time for Lobsterfest again! 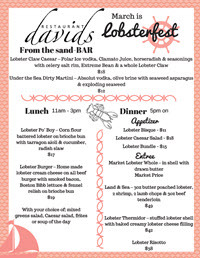 Join us for lunch or dinner at David's in March and enjoy specially prepared cocktails, appetizers, and entrées featuring east coast lobster. Join us for dinner on Valentine's day for a special menu prepared just for you! 3 course meal for $60 per person. Call 519-583-0706 to make your reservation today. Join us in the Double Olive Lounge on Sunday, February 5, 2017 for Super Bowl LI. There will be a tailgate buffet starting at 5pm, custom cocktails, and $2 pool. Tickets are $15 in advance, and $20 at the door. Dover Coast Residents $10. Call David's today to get your tickets! 519-583-0706. Join us on Friday, January 27th for our 2017 New Menu Release Dinner Party! The evening begins at 5:30pm and will feature a cocktail hour accompanied by hors d'oeuvres & oysters. Cocktail hour will be followed by appetizer tasting courses, entrée tasting courses, and dessert tasting courses. The evening will conclude with live entertainment until 11pm. Seating is limited to 60 guests so reserve your spot now! Tickets are $100 per person and are available at David's Restaurant or by calling 519-583-0706. Join us for a Christmas Buffet! Celebrate with a Christmas Buffet Lunch or Dinner on December 23rd! We will be offering four seatings: 11am - 1pm - 5pm - 7pm. Lunch is $20 per person, and Dinner is $30 per person. Make your reservation early because space is limited! Call David's Restaurant today at 519-583-2112. 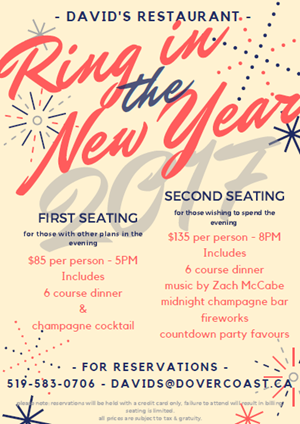 Ring in the New Year at David's Restaurant! 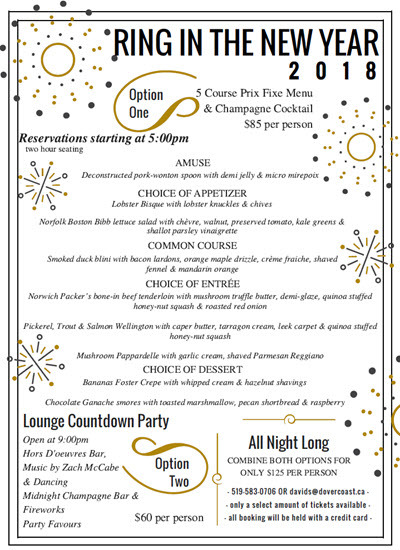 Join us at David's Restaurant to Ring in the New Year! We will be offering 2 separate seatings, One for those with other plans in the evening, and one for those wishing to spend the evening with us! Seating is limited! 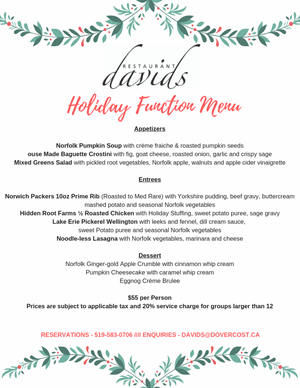 For reservations call 519-583-0706 or email davids@dovercoast.ca. Host your 2016 holiday party at David's Restaurant! Enjoy the bounty of Norfolk County at David's Restaurant Harvest Dinner being held Sunday, October 16th! Join us on the lakeside patio for music & hors d'oeuvres, followed by a four course meal at David's Restaurant specially created to highlight the best of Norfolk! Tickets are $60 per person! Reserve your spot today by calling 519-583-0706 or emailing davids@dovercoast.com. 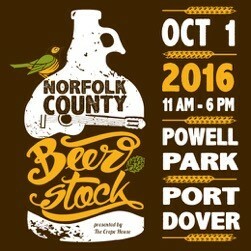 Join David's Restaurant on October 1, 2016 at Norfolk County Beerstock being held at Powell Park. The event runs from 11am to 6 pm and is open to all ages. Beau's + David's Present Father's Day Dinner! Celebrate dad with 3 courses all paired with a special Beau's brew! Join us at 5pm on June 19th for our charity event to raise funds for prostate cancer. $50 a ticket, entertainment provided by Black Creek Music! 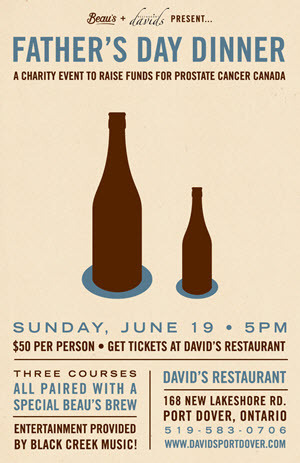 Get your tickets at David's Restaurant! The collection will consist of four dinner served designed and prepared by Chef Scott McRae. Each will feature different local purveyors of David’s Restaurant. The meals will all be served family style and will highlight the products of the featured party. Included with dinner is a wine pairing, limited cash bar & non-alcoholic beverages. Each soirée will commence at 5:00pm and dinner will be served at 5:45pm. Tickets are $75 per person/per date OR Purchase tickets to all four dates for only $250. Spend Mother's Day, Sunday, May 8, 2016, with David's Restaurant and enjoy our special menu that is sure to make your mouth water. Reservations are required, and tables will be reserved for 2 hours from the time booked. Call 519-583-0706 today! Woolley's Lamb available exclusively at David's Restaurant! David's Restaurant has purchased Woolley's Lamb entire herd for lamb racks for 2016. Join us at David's for 100% Grass fed lamb raised right here in Norfolk County. For more information, follow the Shepherd on twitter, or visit their website today. David's On Tour to be featured on the Food Network! Last Fall at the Norfolk County Fair & Horse Show, David's own Mark Stortini was filmed for the tv show Carnival Eats! Don't miss the 308th episode which will air on The Food Network Canada on Saturday, May 14th at 8pm EST. Visit the Food Network for information on Carnival Eats and to see past episodes. Join us in watching the 88th Academy Awards! The 88th Academy Awards will be shown on the big screen in The Double Olive Lounge on Sunday, February 28th. The festivities will begin at 5pm and will include themed appetizers & drinks (1 drink + 1 appetizer for $15) and a chance to win a $50 gift voucher when you "Guess the Winners"! For reservations please call 519-583-0706. 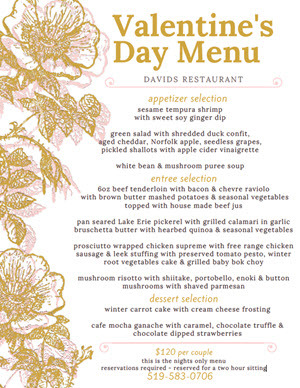 David's Restaurant has created a delicious Valentine's Day Menu that was designed to be shared with a loved one. Two can dine for $99 this Valentine's Day Weekend! Live music Saturday & Sunday night will be: Cameron & McNeil on Saturday night, and Paul Mallard on Sunday night. View our Valentine's Weekend Special Menu here. For reservations call 519-583-0706. Join us for Superbowl 50! We would like to take this opportunity to wish one and all the very best of the season. If you happen to be travelling to see friends or family we encourage you to go safely and most importantly to take time for yourself in this hurried world. Dover Coast operations continue to grow and 2016 will be no different. We will be introducing another 2 golf holes (numbers 10 & 18 as per the site plan) which will mark the completion of the back 9. We will be seeding these two holes in the spring of 2016 with an anticipated opening of July 2016. Significant earth moving has begun as we are getting set to release Phase II of the Dover Coast Adult Lifestyle Community. This phase will introduce 127 additional homes with a significant feature being the beginning of the road from New Lakeshore Road to Highway 6. So what doesn’t change at Dover Coast. Well, that is easy. Our commitment to you our customer. Whether it be our home construction at Dover Coast, our food and beverage operations at David’s, our exceptional spa services at Element’s Day Spa or fantastic golf operations at The Links at Dover Coast, we remain committed to finding you great value in everything we offer while staying true to our roots in Norfolk County. Your use of our facilities will never be taken for granted and always afford you recognition of being a well informed consumer. Merry Christmas and a tremendous 2016 to all. Norfolk County wins Ontario Culinary Tourism Leadership Award! Norfolk County has won the Ontario Culinary Tourism Leadership Award for its work in promoting local food and farmers, encouraging local chefs to use Norfolk County ingredients, and luring tourists to visit and spend money on agritourism and culinary tourism in Norfolk County. Join David's Restaurant on Friday, January 22, 2016 for the 2nd Annual Wine Maker's Dinner. Proceeds from the event will help support the Norfolk General Hospital Foundation. Last year we were able to donate $5000! This year with the help of Scotiabank we hope to surpass this figure. Tickets are $130 per person and would make a wonderful gift this holiday season! The evening includes: Social & Silent Auction at 6pm, Dinner at 7pm, and Live Entertainment beginning at 9pm. 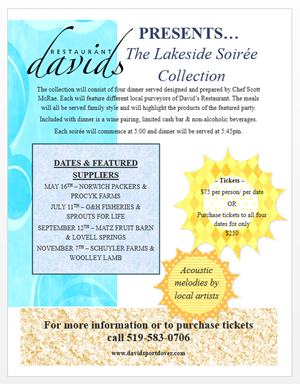 Tickets can be purchased at David's Restaurant, by calling 519-583-0706, or emailing mark.stortini@dovercoast.ca. View the Menu and Wine Pairings here. Host Your Holiday Party at David's Restaurant! 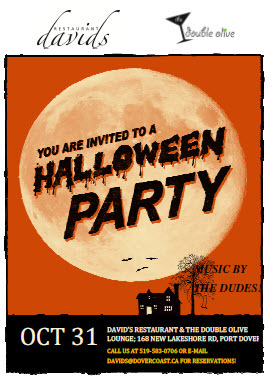 You Are Invited to a Halloween Party! Join David's Restaurant for a Halloween Party on October 31, 3015! Live Musical Entertainment by the Dudes! Call us at 519-583-0706 or email davids@dovercoast.ca for reservations! Norfolk County Fair & Horse Show! Come visit us as we aim to repeat as "Best Food Concession" at the 175th edition of the Norfolk County Fair. This year we will be featuring some old favourites such as Arancini and introducing a few new menu items. See you at the Fair! We would like to take this opportunity to thank Summer Adams for her years of dedication and support with us here at David’s Restaurant. Summer is a natural leader and has been instrumental in growing David’s into the premier smart casual dining facility it is today. It has been a pleasure to know Summer, both professionally & personally. Summer will be leaving us mid October and we wish her all the greatest success in her future endeavors. Thanks Summer and all the best – your friends at David’s of Dover Coast. As we move forward we would encourage you to contact Nicole Inglis who will be leading the dining operations at David’s Restaurant. Nicole has been with us for the past 2 years and has grown in her own right to be a dynamic and energetic individual. Should you or your group wish to book a function or party please do not hesitate to contact Nicole and she will do her best to help you with your needs. Don't Miss Our Thanksgiving Features! Join us this thanksgiving for delicious Cornish Hen and Pumpkin Cheesecake! Available all thanksgiving weekend! See our Special Holiday Menu Here. It's almost time for Lobsterfest again! 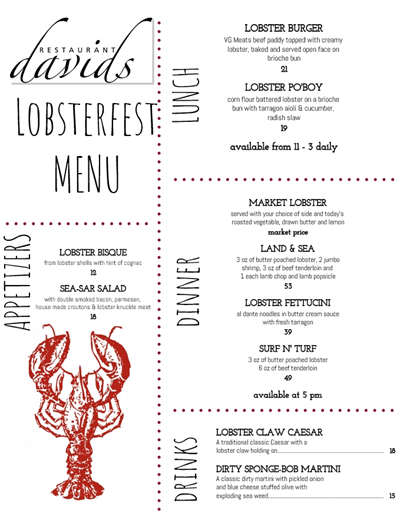 Join us at David's during October and enjoy specially prepared appetizers and entrées featuring east coast lobster. Visit the Holiday and Special Menus page for a complete listing of the Lobster menu choices available. David's Restaurant Featured in Cuisine Scene with Lani Ferguson! Check out the Cuisine Scene article by Lani Ferguson featuring David's Restaurant: Where 'local is not a trend, but a principle belief' and watch the full Cuisine Scene Episode 16 as we watch Dover Coast COO, Mark Stortini show Lani Ferguson how the Surf and Turf is prepared here at David's Restaurant. Be the first to play "The Links at Dover Coast" this July 1st! The Links at Dover Coast opens on July 1st and will start with an official ceremony at 9 a.m. Two-for one green fees and cart rentals will be offered all day. Special events include an outdoor barbecue from 12 to 4 pm, vendor tents from 10 to 4 pm and music by the Dudes from 12 to 6 pm. There will also be all-day bocce ball and a pickle ball clinic at 1 pm. Enter our draw for a chance to win the 1st foursome to play our course!. Tickets can be purchased at David's Restaurant and are $5.00 each or 5 for $20.00. The winnerr will be announced June 27th. Treat Your Dad on Father's Day! On Father's Day, treat your Dad to an afternoon on our Lakeside patio! Chance to win 2 rounds of golf at the Links of Dover Coast. Tickets can be purchased at David's Restaurant. David's Restaurant will be closed Sunday, June 14, 2015 to host the Dover Coast Grand Opening of Phase Two. South Coast Shuttle - Port Dover to Long Point! David’s of Port Dover is delighted to be one of the stops for the Port Dover to Long Point South coast shuttle. This weekend bus shuttle tours a 50 kilometre route along the lake Erie coast of Norfolk county. It connects the communities between Port Dover and Long Point, with stops at Vittoria, Normandale, Turkey Point, Booths Harbour, and Port Rowan. The bus will run on the weekends from May 19 to September 27th, with at least one bus per hour. Tickets are $2 in town and $6 out of town. David's will be holding a Luncheon Brunch Buffet & a Dinner Buffet on Sunday May 10th. The Brunch Buffet is $35/person & the Dinner Buffet is $40/person. Click for David's Mother's Day Buffet details. Coupon for 15% off any Regular Menu Items until March 29th! Our new 2015 menus have now been released and we want to give you a Break in the month of March. Get 15% off any regular menu items. Promotion ends March 29th. On Thursday April 23rd, the 3rd annual Ladies Night Out & Fashion Show will be held at David's Restaurant. Tickets are $30 each and are available at David's Restaurant and 13 Reasons. Quantities are limited so buy your ticket early! There will be door prizes and parting gifts! Portion of all proceeds in support of Big Brothers Big Sisters of Grand Erie. Join us in the Double Olive Lounge upstairs at David's to watch Super Bowl XLIX on Sunday February 1, 2015. Pre-game Buffet at 5pm and kick off at 6:30pm. Advanced Tickets $15; Tickets at the Door $20. Dover Coast Residents $10. There will also be Custom Team Cocktails & a Cash Prize Pool! Tapas & Wine Pairings in the Double Olive Lounge! Join us Thursday February 5 from 6-9pm in the Double Olive Lounge for an evening to pair our new wines with some tasty tapas. View the live food stations and chosen wines . Cast your vote on your favorite wine for a chance to win that bottle! Join us for Date Night in the New Year! Date night will continue on Wednesday nights after January 1, 2015. Go to our Holiday and Special Menu Page for more details! 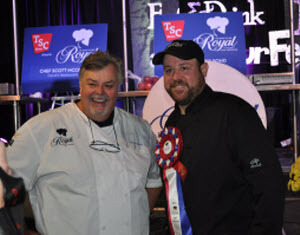 Chef Scott McRae wins Semi Final Round at the Royal Winter Fair! 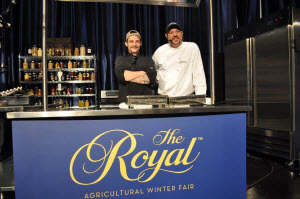 Congratulations to Scott McRae (chef) & Ryan Murphy (Sous Chef) of David’s Restaurant for winning the Semi Final round at the Royal Agricultural Winter Fair on November 8th! The Final round will be held on Saturday Nov 15th. Please note that from 9am until noon on December 22, 23, & 24, the front doors at David's Restaurant will be open for those interested in getting last minute Gift Certificates. There are two scheduled seatings for this year's celebrations. The first is for those with other plans later in the evening, the second is for those wishing to spend the evening with us. The first seating must depart by 7:30pm so that we can prepare for those arriving at 8pm. The early seating includes a 4 course dinner and champagne cocktail for $79 per person. The second seating includes a 4 course dinner, live entertainment, champagne bar, fire works countdown celbration, and party favors, all for only $125 per person! Limited Seating is available, so book your reservation today! For the upcoming holiday season, David's has prepared a Dinner Party Menu as well as a Lunch Party Menu featuring starter, entrée, and dessert of your choice. The Dinner option is $49 per person (plus tax and gratuity) and the Lunch option is available for $35 per person (plus tax and gratuity). January party bookings are also available with same menus - save 20%! Included in both packages are: fresh, white, crips table & napking linens, candlelit table settings, fresh house-made bread, and personal menus with company logos (if desired). Also available for the holiday season is a Private Tapas Holiday Party, with unique food stations, held in the Double Olive Lounge. Room Bookings begin at 5pm and run the entire evening. Limited dates are available, so book early to avoid disappointment! 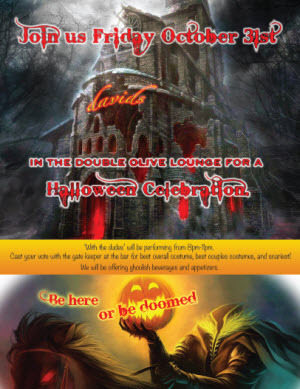 Join us on Friday, October 31, 2014 in the Double Olive Lounge for our Halloween Party! There will be spooky cocktails, ghoulish appetizers, and prizes for best costume! 'With the Dudes' will be the entertainment for the evening. Scott McRae, the head chef at David’s Restaurant in Port Dover, edged two other challengers this weekend at the Road to the Royal cooking competition at the Norfolk County Fair. McRae, assisted by colleague Ryan Murphy, topped teams from the Blue Elephant and The Combine restaurants in Simcoe on Saturday. McRae will compete against seven other regional finalists for the provincial title at next month’s Royal Winter Fair in Toronto. McRae impressed the three-judge panel with a meal of braised pork belly sautéed in apple cider offset with a hint of spicy kimchee. For dessert, he whipped up servings of biscuit pumpkin pie with ice cream. At the Royal, McRae will compete against chefs who prevailed at the Peterborough Fair, the Barrie Fair, the Paris Fair, the Great Northern Exhibition in Collingwood, the Markham Fair and a chef selected to represent Toronto. The semi-finals will be held Nov. 7-8 while the finals will be held Nov. 15. The 92nd Royal Winter Fair runs from Nov. 7 to Nov. 16. It will be held at the Direct Energy Centre and Ricoh Coliseum. 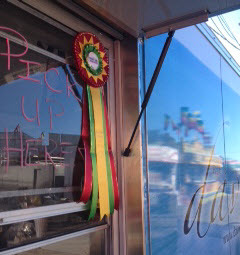 David's On Tour Food Trailer received the Excellence Award for "Best Overall Food Concession" at the 174th Norfolk County Fair. This is the first time a first-time vendor has won the award! Please note that the Double Olive Lounge will be closed this evening, Friday, October 10, 2014, but our dining room remains open! Gather up your family and join us for an all day menu featuring local foods. A choice of appetizer, entrée, and dessert for $35 per person. Check out our Holidays & Special Menus section of our website. Drop by David's during the month of October and enjoy mouth-watering appetizers and entrées featuring east coast lobster! 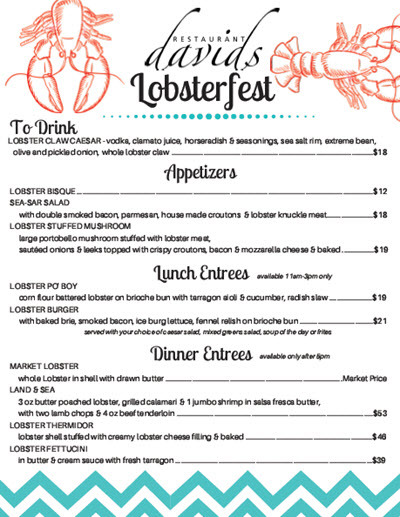 Visit the Holiday and Special Menus page for a complete listing of the Lobster menu choices available. Don't miss our great entertainment lineup this August. Friday night - Bobby Cameron, Angela Hare, Les Pickard & Paul Mallard. Saturday night - "Wild Vines", "Grey Sky", Felicia McMinn, John Tayles & "The Dudes". Check our Entertainment and Events calendar for dates and time! Not Another Tie! Get Dad What He Wants - Beer!